What an amazing word picture, “They shall mount up with wings as eagles.” Yet it can get lost in the literal translation. The Septuagint (Greek translation of the Hebrew Bible) translates, “they shall put forth new feathers like eagles.” The mature eagle molts his old feathers and new ones grow in their place. They molt in a symmetrical pattern. When a primary feather is molted on the left wing, the same feather is molted simultaneously on the right wing, this can ensure the eagle is balanced in flight. God has such a fabulous design does He not? Renewed feathers, means renewed strength. The feathers are not grown over night, there is a ‘waiting’ process, but in this waiting there is HOPE. When the new feathers come in there is literally a ‘mounting up’, basically suggests movement from a lower to a higher place, can you hear the flapping of the wings? As the eagle makes his ascent, he spreads out those lovely strong new feathered wings, seeking the wind current and SOARS! THIS is what God wants of us! Some of us have ruffled feathered wings, some… well… they are just plain GONE! When we have lost our strength, no longer have the means to soar, we wait… we HOPE … IN HIM. 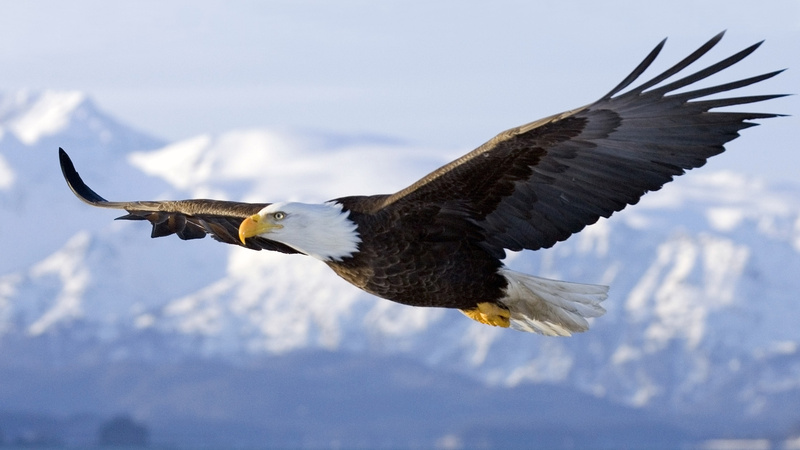 We then are like the eagle, we are given new feathers, new strength, new BALANCE! This entry was posted on February 14, 2016 by Inspired Fountain. It was filed under * Miscellanous Stuff and was tagged with Mount with wings of eagles, new wings.